In addition to the below FAQ's, you can find our comprehensive FAQ support and article center at support.inkedibles.com. What is edible ink made of, and is it safe? How do you refill edible ink cartridges? What is the Inkedibles printhead cleaning solution and how is it used? What are frosting sheets and how do they work? How does edible ink printing work? What printers can be used with edible inkjet printing? Why choose the Inkedibles brand? What is the Inkedibles Photo Contest and how does it work? What are the best printer settings to use for printing with Inkedibles? Which printers are considered good for edible cake printing? How does Chocolate Transfer work? I have another question, how can I get support? Edible ink is essentially edible coloring that is formulated and engineered in a food grade laboratory to have the necessary characteristics (viscocity, droplet size, charge etc) in order to be jetted through an inkjet printer in a way that allows digital images to be printed onto edible paper, also known as frosting sheets or wafer sheets. Edible ink printing allows cake decorators to inexpensively produce digital images from customer photos or other designs in a way that can be applied to a cake. The way this works is that the cartridges of the printer (food grade cartridge containers) are filled with edible ink, and this edible ink gets jetted onto the edible paper (frosting sheets) as they flow through the printer. The printer does not know that it is using edible ink as opposed to regular ink, and it does not know that it is being fed with edible paper (frosting sheets) as opposed to regular paper. What comes out of the printer is an image that is fully edible - both the sheet on which it is printed, and the ink which is used to generate the image. The frosting sheet is then applied onto a cake that is layered with frosting, and the frosting sheet absorbs into the cake frosting in a way that leaves the image beautifully pasted onto the cake and amazes customers and friends. Edible ink should be used in the manner described above, for food decoration purposes only. InkEdibles also offers an innovative edible ink printing technology, whereby the same edible ink can be jetted directly to food, bypassing the need for edible paper. This technology is encompassed by our Direct to Food CakePro series printers, which are capable of printing directly to food (such as cakes, cookies, macarons, marshmallows, and more). 2. What is edible ink made of, and is it safe to eat? As long as the edible ink you use is being made by a trusted manufacturer, is FDA compliant and passes food safety tests, it is safe to use as directed - as a food coloring agent to be printed to edible paper using an inkjet printer. Inkedibles ™ brand edible inks are manufactured under stringent food safety and quality control conditions and are 100% FDA compliant. Our edible inks are a proprietary formulation of water, glycerin, ethanol, preservative and FDA approved colorants, that are formulated and engineered to flow through inkjet printers such as popular Canon and Epson printers. They are manufactured using machinery that does not come into contact with food allergens, and are made in accordance with the FDA Code of Federal Regulations - 21CFR). 3. How do you refill edible ink cartridges? Edible ink cartridges are essentially "containers" that are made in the shape and form of an inkjet cartridge that plugs right in to your inkjet printer. Inkedibles ™ brand cartridges are refillable and come with auto-resetting chips to ensure that your printer can continue to accept them, refill after refill. The regular printer cartridges that your printer uses typically have one-time chips, that sense the level of ink in the cartridge, and when the cartridge empties - send a signal to the printer that the cartridge is empty and needs to be replaced. More often than not, the printer will not accept that cartridge again even if it is refilled, because it still "remembers" the cartridge (via the cartridge chip) as empty. With brand cartridges this is not an issue, because the chips we put on our cartridges are auto-resettable which means that when the cartridge runs out of ink, the chips reset and allow you to refill the same cartridge, and your printer will recognize it as full again. It is recommended to refill the same cartridge more than 3 times, as the wick (outlet port) of the cartridge can wear out over time. Inkedibles cartridges have easy to fill refill ports. Simply remove the plug from the refill port, and inject Inkedibles refill ink which is sold in refill bottles. 4. What is the Inkedibles printhead cleaning solution and how is it used? 5. What are frosting sheets? Frosting sheets are also known as edible paper or icing sheets. They are the substrate that you print to with edible inks for cake decorating purposes. Frosting sheets are backed with plastic so that they slide through your printer in much the same way that normal paper does, and they get printed to with edible ink. Then the plastic backing is removed, and the frosting sheet aka icing sheet is applied to a layer of frosting on top of the cake. 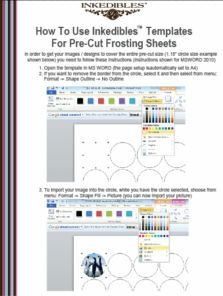 See below for instructions on how to print to your frosting sheets and apply them to your cake. Frosting Sheets are available from Inkedibles in different shapes and sizes. The most common sheet frosting is the Inkedibles full sheet size (8.5 inch x 11 inch, or letter size). Inkedibles also offers other fun precut sizes as well, such as Precut 1.18 inch circles (48 circles per sheet), Precut 2.0 inch circles (15 circles per sheet), Precut 2.5 inch circles (12 circles per sheet), Precut 3.0 inch circles (6 circles per sheet), Precut 8 inch circles (1 circle per sheet) and Precut 2.5 inch x 3 inch rectangular cards (8 cards per page). These fun precut frosting sheets are commonly used as cupcake icing toppers, or for smaller / special size cake toppers. 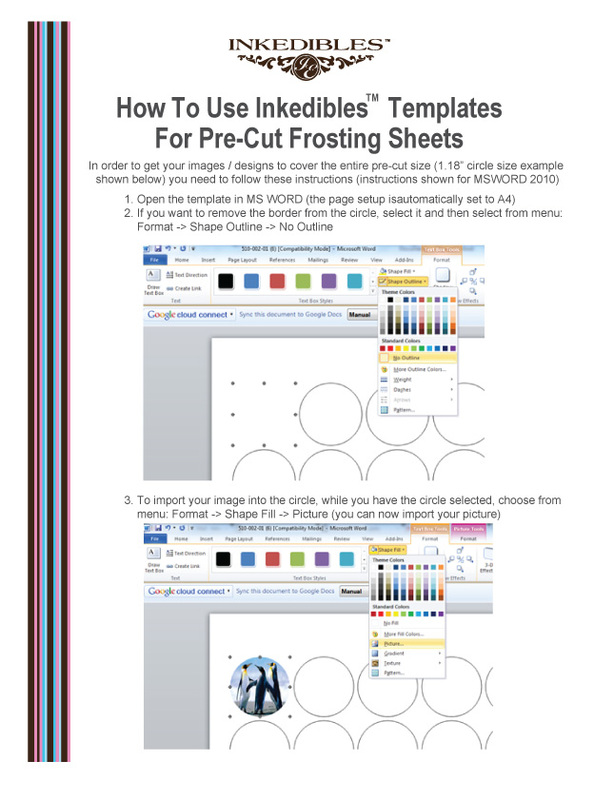 The precut frosting sheet sizes are easy to use - simply download and print using the free Inkedibles templates for each precut size (available in MS WORD). For the full sheet size, the backing is 8.5 x 11 inches. For the precut sizes, the backing is A4 size, and the downloadable templates are already preset to A4 paper size. You can verify the paper size before you print by opening the template in Microsoft Word, and selecting Page Layout --> Size and confirming it is set to A4 size before printing. You can find the frosting sheet options and templates here: Inkedibles Frosting Sheets. 6. How does edible ink printing work? Think of printing a photo on your regular inkjet printer, then placing the photo on a cake. That's how simple edible ink printing is and the process is exactly the same. The only difference is that the ink is not regular ink, it is edible ink (think of edible ink like colored, liquid frosting, that is engineered to flow through your printer's printheads without causing any disruptions to your printing setup), and the paper is also edible (the "paper" is called a frosting sheet, which is a thin wafer of icing that flows through your printer like paper would, and accepts the edible ink as it is printing out). The final product (your digital image printed with edible ink onto your frosting sheet) can be applied to a cake that has a layer of frosting on top of it, and the frosting sheet adheres to the cake and looks like you have printed directly to the cake! A great way to surprise your customers, friends and family with beautiful and custom cakes printed with a regular inkjet printer! CAUTION: DO NOT mix your edible ink printer or edible ink cartridges with regular inks - you should dedicate an inkjet printer and edible ink cartridges ONLY for edible ink printing so that you do not contaminate the edible inks. 7. What printers work with edible inks? This edible ink works in any Canon inkjet printer that accepts the Canon BCI3 / BCI6 / PGI5 / CLI8 / PGI220 / CLI221 / PGI225 / CLI226 inkjet cartridges. 8. Why choose the Inkedibles Brand? Inkedibles is very proud of its brand and line of products and has spared no costs to ensure that the inks we offer are of the highest quality inks on the market for print quality, food safety, and printer compatability. We hold our brand to the highest standard, and this is why we have been testing and developing our line of products for over 2 years before releasing them on the market. We believe we have the best quality product on the market, at a competitive price, and we stand behind our product 100%. If you are in the cake decorating business, or if you are thinking of getting into the cake decorating business, you will not be dissapointed by trying our products and we are sure that you will be a regular customer. Give Inkedibles ™ a try and let us earn your repeat business. 9. What is the Inkedibles Photo Contest and how does it work? Note that you own full copyright over the image that you upload but we are granted a license to display the image for the purpose of providing our services. If you do not want your image displayed on Inkedibles anymore you can request to have it removed at any time by contacting us.Click here for the Terms of participation in the Photo Contest. 10. What are the best printer settings to use for Inkedibles printing? 11. Which printers are considered good for edible cake printing? 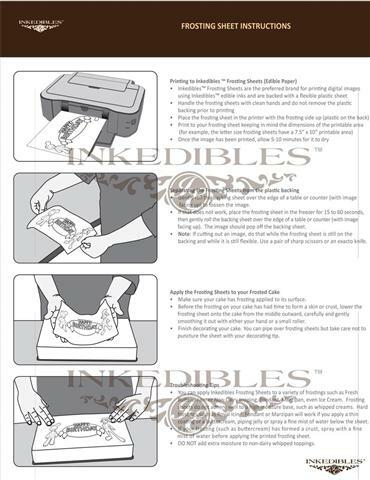 Inkedibles offers edible printer bundles to make it easy for a startup bakery or home-based cake maker to get into the edible cake printing business. These printer bundles typically are focused on Canon printers which are bundled with Inkedibles edible ink cartridges. Canon printers make good edible cake printers because they have removable printheads, and slots for individual ink tanks. Inkedibles has developed edible ink cartridges for many of the Canon printer lines. 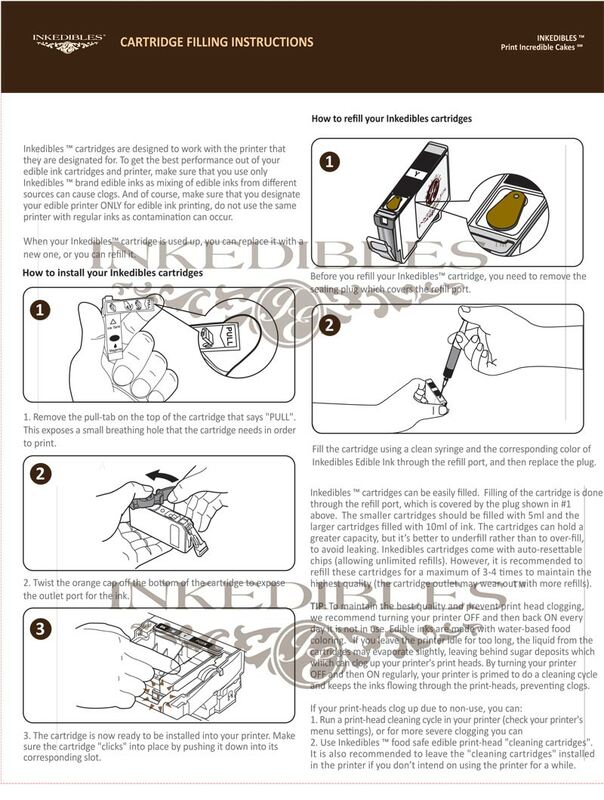 If you have your own printer for which Inkedibles offers edible ink cartridges, you can simply buy just the Inkedibles edible ink cartridges, however you should make sure that you dedicate your printer ONLY for edible prints and should not use a printer that has been used in the past with regular inks. Do not mix edible and regular inks in the same printer to prevent contamination. It is for this reason that you should also buy only new printers for your edible printing. Inkedibles also has developed a line of edible inks for Epson, as some bakeries use Epson printers for edible prints. 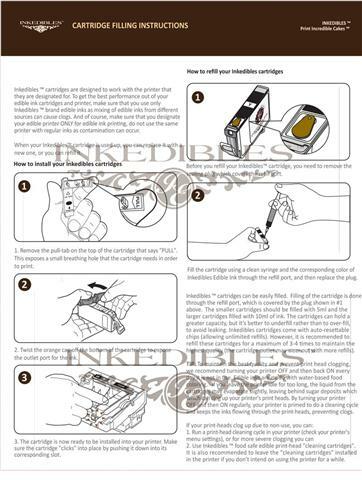 For those who want to refill their edible ink cartridges, Inkedibles has made their cartridges easily refillable, so edible ink refills is all you need. 12. How does Chocolate Transfer work? Create beautiful, signature chocolates and pralines with this new unique chocolate mold! Professional quality, 2 piece Magnetic Mold is constructed of food safe, clear, rigid polycarbonate. Detailed sharp corners produce professional chocolates! First, you need to start with a chocolate transfer sheet that has your desired image or design. You can either print your own custom images onto Inkedibles Chocolate Transfer Sheets using a printer that is dedicated to using only edible inks (use Inkedibles Edible Inks and Inkedibles Transfer Sheets for consistent results), or you can use pre-printed transfer sheets such as those available from Inkedibles. Depending on whether you will be using a chocolate mold (to make predesigned chocolate shapes, like circles, or hearts) or whether you will not be using a mold, your next steps are similar with exception of using a mold or not using a mold. 13. I have another question, how can I get support?